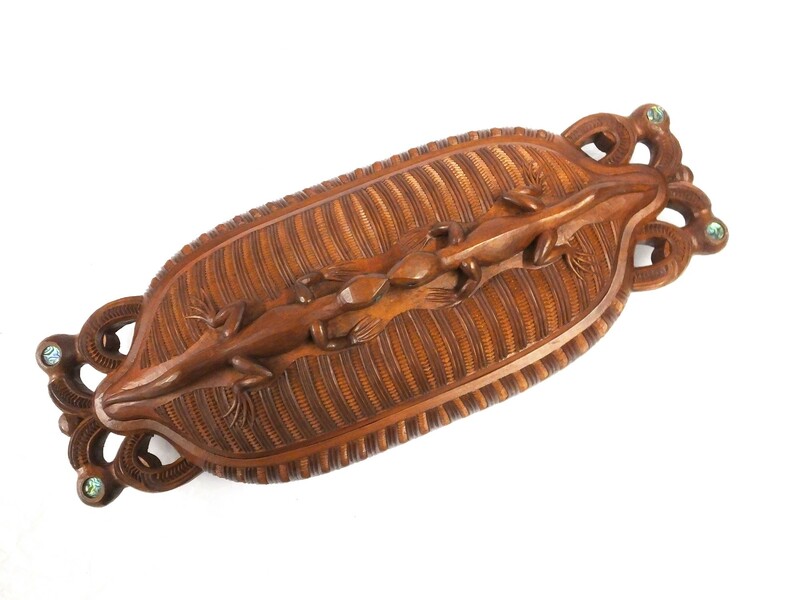 A carved Maori wooden treasure box (papahou) of flat oval shape. The separate lid is carved with two lizards with haliotis-shell eyes facing each other, and the box is carved with a basketwork pattern with two stylised birds at each end, also with haliotis-shell eyes. The shallow interior of the box is plain. Maori teasure boxes were traditionally hung on cords from the rafters of the house, and for this reason they often had elaborate carving on their undersides. They were used to store ornaments, feathers and other precious objects owned by high-ranking individuals.